What’s beautiful about the independent coffee shops is their personality. Which we often come to know as soon as we cross the doorstep. Making up the first encounter, feeding our senses with the first impression, it lets us catch a glimpse of the owner himself. Like, when you visit Playground, you get to understand who Fabian and Lilly are, and when Kawalerka – I felt like I already know much about Marl, the barista. I am in Wroclaw, a Polish city overwhelmed with snow these days. I am finishing my first review, snuggling down at Gniazdo. My phone suddenly vibrates and I see a message from Kawalerka. They ask, when do I wish to pay them a visit. Sighing and blushing, I discover what they really think of my Polish, when they offer me an interpreter: taking what I’ve learnt to say in Polish, they’re probably right. After all, silence is golden, isn’t it? I take all my belongings and, after waving goodbye, run away from Gniazdo towards another side of the city. Finally, I find myself at the university area. Crossing the bridge on the Oder River, I had the sense of a different story yet to be unfolded. The entrance reminds me of Mitte, a hostel-coffee shop in Brno, whose curtains guard the interior, promising the unveiled mystery. Marl is waiting for me behind the counter. Here, she and Maciek will be my cicerones. 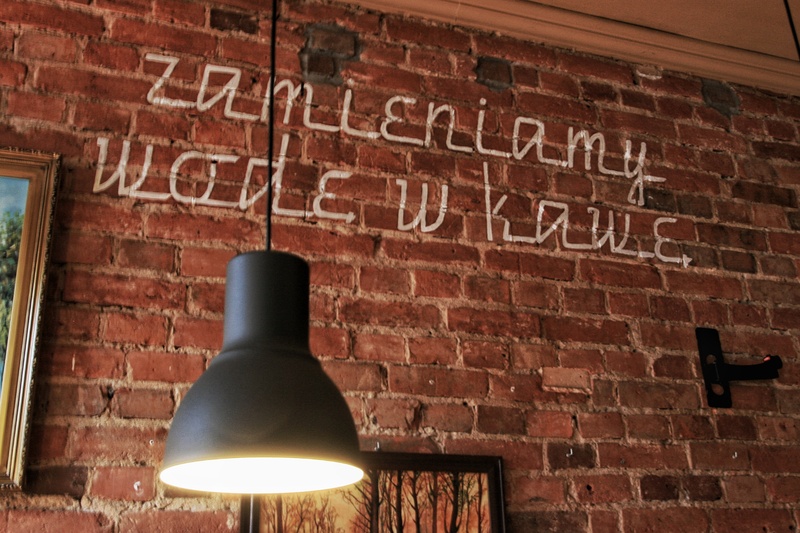 And even though Polish isn’t my kinda language, one thing is clear – her passion speaks through her. Without words I understand her eagerness to learn all about coffee. They both show me with pride, all the options for their filter coffee: four coffees sleeping and waiting to be brewed, three from Netherlands, one from Coffee Proficiency. Marl explains how they had a little celebration the day before, their fourth anniversary, and how they cupped some nice coffees on the occasion. A fruity Colombian won the competition and a lucky me – gets one too. I let Marl do her job, and take a sit next to Maciek. He looks thrilled to talk to me about our shared love for coffee. First story is about their fascination with the speciality coffee, how he vividly remembers the day he saw Marl bringing some, one year ago. His compliments to Marl have no end. It amazed him that, even though she’s not the owner, she loves the shop like no one else. She has transformed their café immensely, pushing it forward day by day, getting closer and closer to the humble excellence. In this battle, her weapons are always passion, curiosity and impeccable customer service. 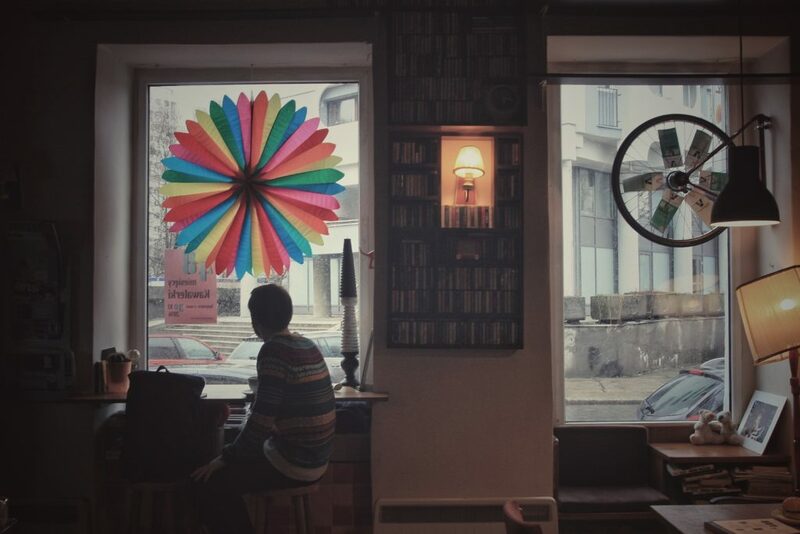 Kawalerka is a lovely coffee shop, thus let’s not forget how, apart from the passion for coffee, it yet reflects much more. It’s an ode to love for a juvenile art: music, photography, poetry… Cassettes wait for you in the musical library, hanging from the walls. Facing them, on the other side, you see classy vinyl collection. On the main wall – papers with sentences, verses, poems. At some point Maciek invites me to visit the toilet. That’s… weird, I’m thinking, but a squint at Marl assures me I’m safe and they’re sane. Marl mentions a surprise – even weirder, who hides surprises in toilets? It turns out there is a tiny hall that leads to the actual toilet, and their idea was to make it fun. Making toilet experience fun like enhancing coffee experience with excellent coffee quality and unique café vibe. Quickly it’s getting clear what the surprise was all about: I discover they included me among “Customers we don’t serve”. I’m loving to see my grinning face next to the filter coffee I’ve just received. 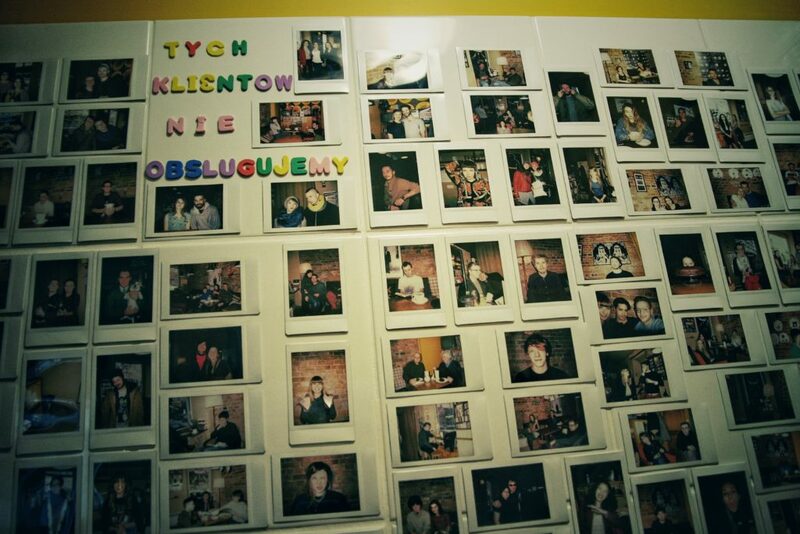 On the polaroid picture, taken few minutes ago, and placed proudly on the wall filled with happy customers. We have a laugh, and it feels more like sunny Barcelona than snowy Poland, when I realise how a good Colombian coffee, a mix of light Kenyan flavours and fruits, may do wonders in connecting people. Piotr and Krzysztof, owners of Kawalerka, launched Kawalerka Cafe project more than four years ago. They saw so many coffee shops in the capital of Poland. Those cafes were everywhere, in every single part of Warsaw. After they got back to Wroclaw they realised, that there were only few good coffee shops around. That was the moment to occupy that market niche and open Kawalerka . 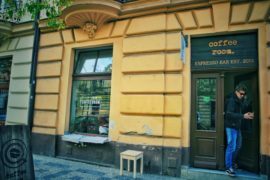 By then, their main goal was to provide the best coffee in Wroclaw and create a cosy place for their guests. But the coffee industry is dynamic. 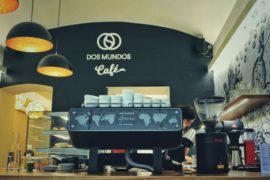 They realised that their ever growing coffee awareness and their customers’ have made them reshape the approach of the coffee shop. Kawalerka started at the very beginning Espresso focused. A year ago filters assaulted the little cafe and V60 and Aeropress were presented to customers. Their Espresso changed too, now they are brewing and serving a blend roasted by a local roastery. MEET THE BARISTA… MARL W.
WHY DID YOU START TO MAKE COFFEE? I started brewing about 5 years ago. My first job that involved coffee brewing was at one university coffee shop. However it was a rather unpleasant experience, now that I think about it, because of their lack of respect towards the coffee and all the brewing and barista activities. 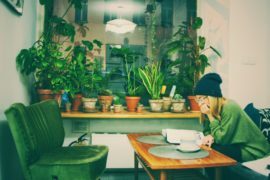 The next job was much better and pushed me completely towards the speciality coffee culture – they invested in my training, where, for example, I had a chance to try my very first aeropress or drip coffee. WHAT IS KAWALERKA FOR YOU? We have a special notebook for our customers, where they can freely express whatever they think about us – the coffee shop, the baristas, the city, the weather, and of course, the coffee that we server itself. I remember one guy entering and ordering an americano. Everything that he said till’ then was just the order, nothing more, not a smile, he was almost robotic. When he took the notebook, he smiled, and left a short, but probably the most positive comment I have seen so far – “It’s cool that you are so normal. Thank you.” Why so positive you may ask? Well, I think that it is the definition of this place – its normal and friendly, for everyone – and this is how I always wanted to keep it. The moment when customers seem not to respect the place – by, for example, bringing their fast food meals or drinks and not even asking if we are okay with it. WHAT IS YOUR FAVOURITE COFFEE? HOW DO YOU LIKE IT BREWED? Recently I am all about milk coffees, which makes flat white my favourite one. Armchairs, sofas, stools (no swings unfortunately!). FILTER: From Two to Four Single Origins. COFFEE MACHINE: Two Groups Faema E91 Ambassador SE. GRINDERS: Fiorenzato EVO64 for Espresso. Wilfa Svart WSCG-2 for Filters. Daily Coffee was founded in late 2015; originally known as subscriptioncoffee.org. It started as a hobby. 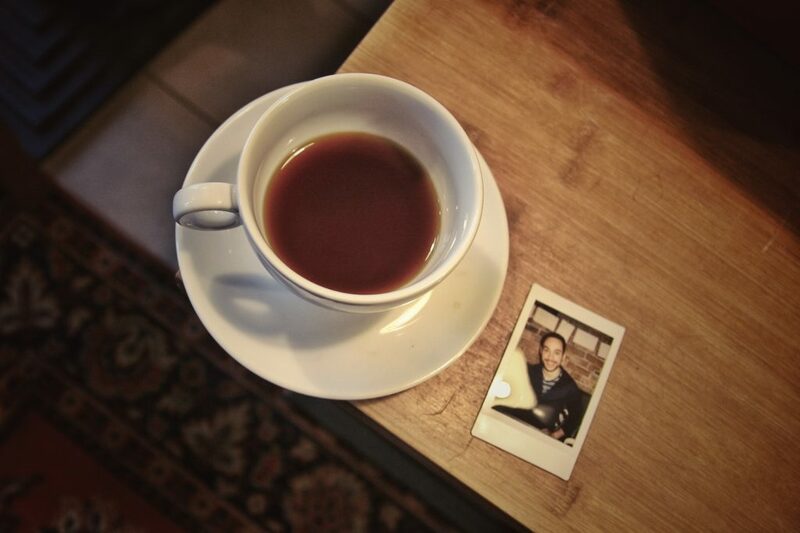 Our founder, Faris, found a way to share and grow his enthusiasm and love for coffee with the world; what better than a blog! As the blog gained traction it slowly grew into the Daily Coffee you see today.